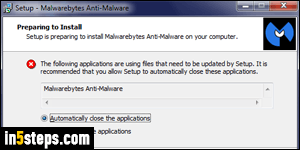 You'll know when a new version of Malwarebytes Anti-Malware is available, because the program's icon in the notification area (system tray) will show a red warning sign with a white exclamation mark. And at some point, you'll see the "A new version of Malwarebytes Anti-Malware is ready to be installed" message. Click on the OK button to download and install it. If you get the message without the updated icon, it could be a fake - don't click OK. When the installer pops up, choose your language and click OK. Click Next, accept the agreement, and review the log of changes. The remaining options should be the same as the ones chosen during previous installations; click Next until you get to the last screen - then, click on the Install button to proceed. 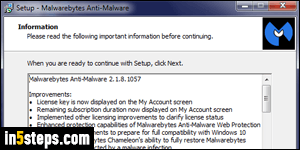 To install the new version, Malwarebytes will need to close, so avoid postpone the installation once you've started (or you'll be without protection!) Keep the "Automatically close the application" option selected, and click Next. Let the installer run its course, and you'll see the last screen in the setup within a few seconds. 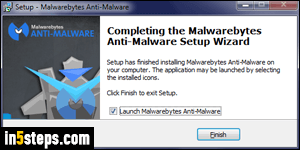 Make sure that the "Launch Malwarebytes Anti-Malware" checkbox is checked, and click Finish. You are now protected with the latest version of MBAM, and it will download the most recent virus definition files. Once it's done updating its database version, you can click on the big blue Scan Now button: this is optional, because as long as your computer isn't turned off whenever you don't use it, Malwarebytes will automatically scan it for malware. You can click on the close button (red "x") - that only minimizes the main window, it doesn't exit the program. You can re-launch it by double-click on its icon in the notification area / system tray.